These stocks trampled the broader market but still have plenty left in the tank. The U.S. stock market has delivered nice gains for investors over the last five years. The S&P 500 has risen about 73%, which is nothing to sneeze at, but a few stocks have done much better. 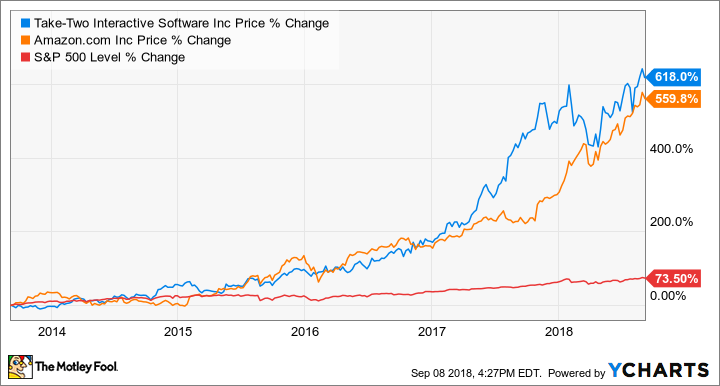 Online retail giant Amazon.com (NASDAQ:AMZN) and top video game maker Take-Two Interactive (NASDAQ:TTWO) have both delivered gains of more than 500% since 2013. Let's review how they did it and what investors can expect going forward. Amazon.com and Take-Two Interactive Stock Performance vs. S&P 500, data by YCharts. Amazon has delivered monster gains for shareholders. Since 2013, Amazon has grown revenue 180%, as its core retail business continues to win over customers and expand around the world. Additionally, Amazon has been successful in creating a sticky ecosystem of products and services to keep customers locked in, including its Prime membership, Kindle e-readers, Fire TV, and Echo smart-home devices. But the blazing growth of Amazon's cloud storage business, Amazon Web Services (AWS), deserves a lot of credit for sending the shares up nearly 600% since mid-2013. AWS revenue has grown 172% since 2015, reaching $21.2 billion over the last 12 months. Similar to the way individuals have been attracted to Amazon's retail offering, enterprise customers have been attracted to AWS for everything from web hosting to backing up databases, among a host of other applications. Because AWS is a software service, it generates much higher margins than Amazon's retail business, which faces cutthroat competition. As a result, the growth of AWS has completely transformed Amazon's bottom line. Over the last five years, Amazon's operating income has expanded tenfold to reach $7.385 billion over the trailing-12-month period; about 75% of that amount was generated from AWS. In 2017, Morgan Stanley estimated that AWS could be worth $270 billion on its own, which at the time represented about half of Amazon's market cap. AWS could conceivably be worth more than Amazon's retail business eventually, if it keeps growing at this pace. In his 2014 annual shareholder letter, CEO Jeff Bezos stated, "Similar to the way I think about Amazon retail, for all practical purposes, I believe AWS is market-size unconstrained." Indeed, you have to wonder if there's anything Amazon can't do. It has successfully expanded into just about every retail category. Its Echo smart-home device (which only makes it easier for customers to spend more money on Amazon) and Fire TV stick were the best-selling products across Amazon in 2017. Additionally, the company could be on the verge of building a significant advertising business, and its recent acquisition of Whole Foods Market makes it a major player in the grocery market. It's that perception of Amazon's unlimited potential to expand, invest, and experiment in new things that has caused the stock to continue hitting new highs despite its nearly $1 trillion market cap. The video game industry has gone through some big changes in the last five years. More gamers are buying their games digitally as opposed to buying physical copies in stores, which is beneficial to game companies' bottom lines since digital sales are not as costly as producing physical game discs. Additionally, game companies are becoming less reliant on having to produce new releases every year to make money. Game makers have been transitioning to a year-round revenue-generating strategy in which a single popular game can be supported with digitally-delivered in-game updates long into the future. This has stretched the life cycle of games out to months and even years in some cases. A good example is Take-Two's massively successful Grand Theft Auto V, which is still going strong five years after its release. It has become one of the single best-selling titles of all time, having sold 100 million copies over the last five years. The game has stayed popular with players thanks to the Grand Theft Auto Online multi-player game mode where players meet up with others in the game and can spend money on virtual currency via microtransactions to unlock extra content while playing. Take-Two also has had success growing its NBA 2K franchise, in which the NBA 2K18 version hit a franchise record of more than 10 million copies sold over the last year. The basketball franchise has had success expanding into China, where Take-Two has a partnership with Chinese social media giant Tencent Holdings to distribute a version of the game in the largest and fastest-growing video game market in the world. Sales of virtual currency across these two franchises have been key drivers of Take-Two's digital revenue growth, which now makes up the majority of Take-Two's annual revenue. This sales mix shift to digital content has greatly improved Take-Two's bottom line from a loss of $8.3 million in fiscal 2016 to a profit of $174 million in fiscal 2018. That improvement on the bottom line has sent shares soaring more than 600% over the last five years. Take-Two has a few things cooking to keep the momentum going. The game maker is about to release NBA 2K19 and has also launched into esports with NBA 2K League, which management believes will be a long-term profit driver for the company. Plus, this fall, it will release the highly-anticipated Red Dead Redemption 2. Amazon and Take-Two show that you don't have to chase hot new stocks to find big gains in the market. Even well-established companies can become multibaggers for shareholders. Although it's unlikely they will deliver 500%-plus gains over the next five years, Amazon and Take-Two are still worth a look for investors with long time horizons.